Strong, lightweight and compact the kit contains 18 remedies covering first aid, accident and emergency situations. Suitable for practitioners and the more experienced user of homeopathy. Injury and accidents usually happen when we least expect them. This high potency Emergency kit from Helios provides you with an immediate Homeopathic resource so you can act fast in first aid situations. Strong, lightweight and compact the kit contains 18 high potency remedies covering first aid, accident and emergency situations. 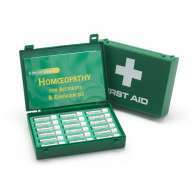 Suitable for practitioners and the more experienced user of homeopathy. The kit contains an excellent booklet to help you prescribe. Remedies: conite, arnica, apis, arsen alb, belladonna, bellis-perennis, bryonia, calendula, cantharis, carbo-veg, china, gelsemium, hypericum, ignatia, ipecacuahna, phosphorus, pulsatilla, silica.